Despite their high-gloss black finish, these double exterior doors provide a classic, yet somber, entrance. Each door has a two-panel design. The panel above the door's mid rail is a lite (the name for a window within a door) of mirrored glass. Mirrored glass, tinted glass, textured glass, and frosted glass all provide an additional degree of privacy and security for exterior doors as passers-by cannot look into a residence. The panel beneath the door's mid rail is the same size as the lite. 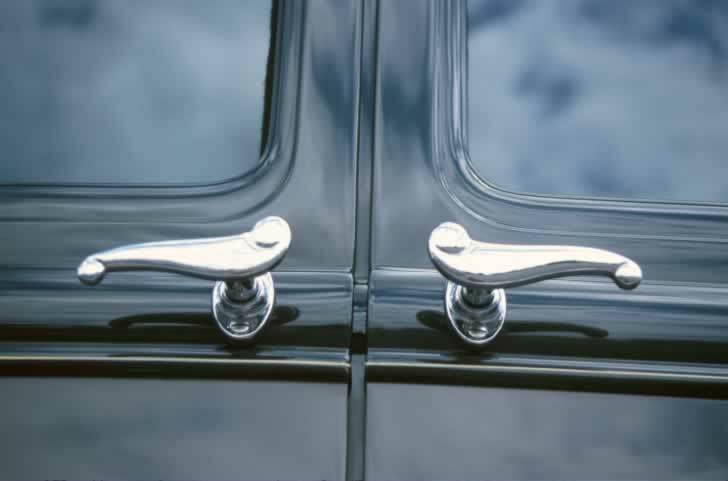 Other than the polished chrome handles, the molding along the doors' mid rail is the only decoration on these doors, as the molding around the glass in the lites serves only to seal water out of the door's interior. These are outward-opening doors. In order to prevent damage to the high-gloss finish, matching polished chrome kick plates should be mounted on the bottom of both doors.